Chief city of the nomarchy of Arthamania, Greece; situated on the Arta, about 7 miles from its mouth. It is the ancient Ambracia, called by the casuists of the sixteenth century Acarnania, and assigned to the Morea. In 1890 it contained 4,328 inhabitants, of whom about 200 were Jews. Little is known of the early history of the community. The casuists of the sixteenth century speak of an old synagogue "of the Corfiotes" (called also "of the natives," ), which leads to the supposition that Jews from Corfu settled at Arta when Roger I. of Sicily took possession of that Ionian island. Moreover, Benjamin of Tudela (about 1170, under Manuel I. Comnenus) mentions 100 Jews (or Jewish families? ), whose leaders were R. Solomon and R. Heracles. The moral tone of the community, though marked on the whole by devotion and even an austere piety, was lowered in individual cases through lack of central administration. Thus, a certain Shemariah b. Abraham dared to maltreat the rabbi Benjamin b. Shemariah and even to say things prejudicial to the community. Another, Solomon by name, stigmatized as apostates the Maranos who, fleeing from Apulia, sought refuge at Arta. Finally, a certain Manoah Politzer (? 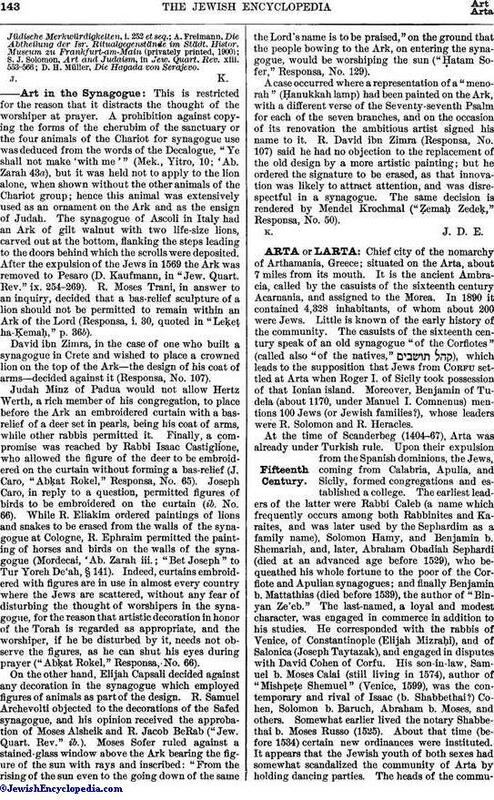 ), with the assistance of two false witnesses, Abraham Turkia and Abraham Tobiel, appropriated (about 1529) the legacy of R. Abraham Sephardi mentioned on page 143. In contrast to this darker side is the solidarity which united not only the Jews living in Arta, but also the latter with those of the neighboring towns. Thus it is recounted that when some pirates robbed a certain Eliezer of Pola ( ) and sold their booty to the Jews of En-Mavra, a notification from the rabbinical body of Arta was sufficient to cause the purchasers to restore the property to the owner in consideration of the expenses involved. Rabbinic studies declined here as in the Orient generally. 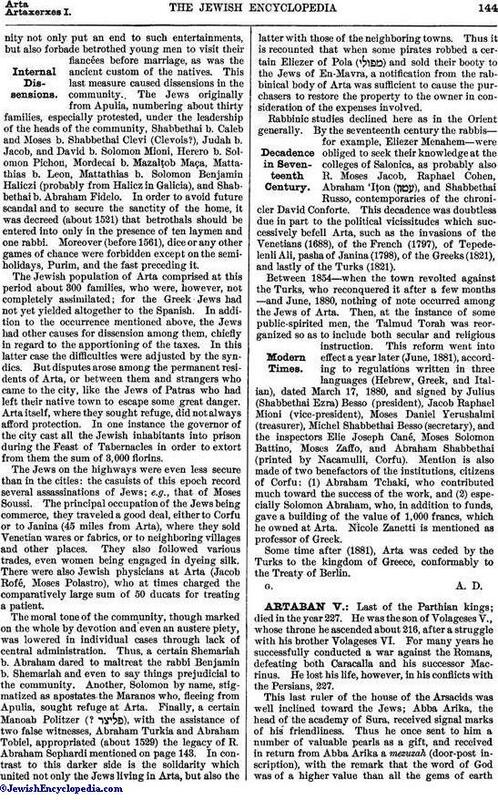 By the seventeenth century the rabbis—for example, Eliezer Menahem—were obliged to seek their knowledge at the colleges of Salonica, as probably also R. Moses Jacob, Raphael Cohen, Abraham 'Iṭon ( ), and Shabbethai Russo, contemporaries of the chronicler David Conforte. This decadence was doubtless due in part to the political vicissitudes which successively befell Arta, such as the invasions of the Venetians (1688), of the French (1797), of Tepedelenli Ali, pasha of Janina (1798), of the Greeks (1821), and lastly of the Turks (1821).